Many children face challenges both inside and outside the classroom. Through a school-based coordinator, Communities In Schools strategically aligns and delivers needed resources so that students can focus on learning. We work within public school systems and maximize the use of dedicated volunteers and community partners. What sets Communities In Schools apart from other organizations is its model of providing a comprehensive range of community services, also known as integrated student services. 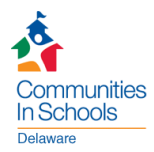 Communities In Schools positions a dedicated staff member – a site coordinator – inside partner schools. In this pivotal role, the coordinator works with school staff to identify students at risk of not graduating. He or she assesses school and student needs and establishes relationships with local businesses, social service agencies, health care providers, and parent and volunteer organizations to harness needed resources. Whether it’s tutoring, eyeglasses or just a safe place to be after school, when these needs are met, students can concentrate on learning. With a largely volunteer base, Communities In Schools is cost-efficient, and the model is adaptable to urban, rural or suburban communities.